Home | Offices | Brazil | Special Piping Materials Brazil Meet at Belo Horizonte. 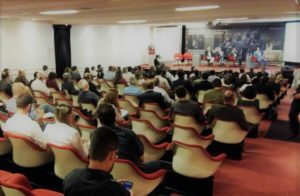 On the 29th November 2016 Special Piping Materials Brazil participated in the 1ST FORUM UK – Brazil of mining, in Belo Horizonte. Many points were discussed throughout the whole day. Including Oil, gas and mining in the industry. Approximately 100 people attended each sit in at the UK-Brazil mining forum, discussing the points and issues of oil, gas and mining in our industry and what problems we have trading across the world and how we can branch out to a bigger and better future.